Nicchio Ristorante proudly announces the celebration of the Feast of San Gennaro with this gorgeous website designed and developed by DDA. Dan Di Cesare is widely known in the town of Belmar for many things: he is an accomplished dentist, restaurateur, Italian, and proud resident of New Jersey. For all these reasons, Belmar chose him to serve as chairman for the town’s first Feast of San Gennaro festival in September of 2012. With Dan Di Cesare’s Nicchio Ristorante hosting the Feast, the client understood that he would need an effective way to get word out about the event and inform the public of the activities that would be involved. The website would be used for subsequent celebrations in the future, so Dan Di Cesare wanted to ensure that he could easily adjust elements of the website in the future. DDA knew how important it was that the authenticity of Nicchio Ristorante’s Italian cuisine be understood by prospective customers, so DDA’s graphic designers focused on classic Italian imagery to ground their work. The entire site judiciously employs a color scheme prominently featuring elements in red, white, green, and tan to evoke the Italian spirit, and an image of Mulberry Street serves as the base of the design to further solidify this aesthetic. DDA custom programmed a content management system (CMS) which allows Nicchio Restorante to easily manage a dynamic calendar of festival events. The back-end also allows an administrator to add and change images and captions found in the photo gallery at will. 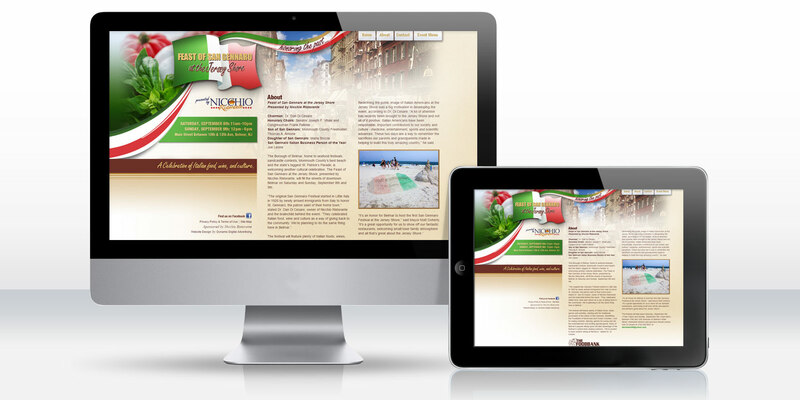 The Feast of San Gennaro website, with its eye-appealing design and easy-to-use back-end administrative capabilities, will prove to be a wonderful asset to Nicchio Ristorante as it continues to host the annual festival into the future.